Exchange-traded derivatives originally only did commodity underlyings. The world's first financial underlying was : currencies. On 16 May 1972, the Chicago Mercantile Exchange started trading in currency futures. To any finance person, nothing is simpler than a currency futures, but unfortunately in India a mixture of ignorance, ideology and turf considerations has hindered progress. In 1996, when NSE had just got started talking about equity derivatives, I happened to be session chairman in a conference organised by Invest India titled The future of India's stock exchanges and I remember asking Ravi Narain something like "Have you thought about other underlyings? Would you trade currency futures?". Ravi leaned into the mic and said "We'd love to.". Most people in India were blinded by the notion of `RBI turf' and did not think seriously about this problem. When I look in my media archive I see a bit on currency futures in Extracting information from finance, August 2006, and in a few pieces before that, but these were just isolated little things. Unbanning currency futures trading was not seriously on the policy radar. When any discussion about this took place, various RBI personnel would claim that futures trading would somehow make Mother India unsafe. In the Indian discourse, the committee report on Mumbai as an International Financial Centre, chaired by Percy Mistry (April 2007), had the first clear text on currency derivatives. In April 2007, a column titled Currency futures now, emphasised the links between a well functioning currency derivatives market and the ability of the economy to absorb exchange rate fluctuations. (This old piece is a good response to Shankar Acharya's column in Business Standard today, where he bemoans the shift away from administered exchange rates. The price of steel and crude oil and the dollar will fluctuate: get used to it and get the right derivatives going). It took 36 years from the date of the innovation (currency futures at CME) to get started with trading in India. For a comparison, with other innovations, India goes much faster. As an example of a technical innovation which also requires government capability, GSM telephony started up in Europe on the late 1980s and in India in the late 1990s - a gap of 10 years. So if we judge arms of the Indian state by the extent to which they impede progress, the governance quality in DOT in the 1990s was better than that seen with finance in the last decade. On 2 September 2008, I was complaining about a crash in productivity. On 3 September 2008, I got a first detailed look at the liquidity of the currency futures market. In a year, on 23 September 2009, one could cautiously suggest that currency futures liquidity was ahead of that on the OTC market. This was clearly visible in the article by Gurnain Kaur Pasricha on 25 November 2009. Here, we were on new terrain: nobody else in the world had done this other than Brazil. The global first-mover, the CME, would envy the liquidity of the NSE currency futures contract. And finally, on 21 April and 22 April of this year, we see signs that the currency futures are more liquid than the Nifty futures. How could this have been done better? There is nothing innovative about launching currency futures. There is nothing more commoditised and better understood than an exchange-traded clearing-corporation-settled cash-settled contract on a currency. But the mixture of ignorance, ideology and turf battles that impedes progress in India is alive and well. With currencies: Currency forwards (and the NDF market) are the only choice for FIIs, who are banned from using the exchange-traded currency derivatives. Corporate users are still pushed by the existing rules to go to the OTC market. Currency options trading will now commence - but only for the INR/USD and not for other currency pairs. And futures trading on all currency pairs other than INR/USD, INR/EUR, INR/JPY and INR/GBP is banned. With interest rates: RBI believes that with interest rate underlyings, cash settlement is somehow dangerous and that derivatives trading on short-dated interest rates will interfere with the conduct of monetary policy. I wonder how that is reconciled with OTC interest rate swaps involving MIBOR, and with the fact that all good central banks in the world are doing monetary policy without banning either cash-settled interest rate underlyings or short-maturity underlyings. In short, currency futures is a good story and a bad story. It is a good story in that in the end, we are one of the best countries of the world in terms of getting exchange-traded currency derivatives to work. It's a bad story in that it took a lot longer than it should have, and the problems that impeded progress continue to be with us. 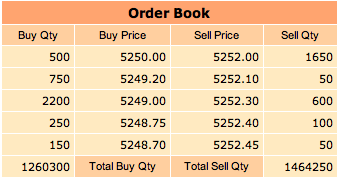 In continuation of yesterday's blog post on the big quantities visible on the order book of the NSE currency futures market, I got hold of order book information for one recent timepoint (10:32 AM on 9 April) for three April expiry futures: Nifty, INR/USD and Reliance. This is not as good as looking at information for today or yesterday, but it's quite instructive. So we expect Reliance will be the least liquid, given the asymmetric information which afflicts individual firms and given the high volatility of Reliance. Both Nifty and INR/USD will have better liquidity since they are macroeconomic underlyings (with low asymmetric information). 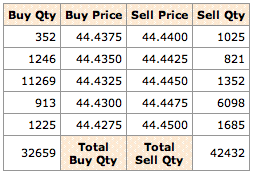 Of these, INR/USD will fare the best because it has a low volatility. The blue line is the impact cost of Reliance. The quantity available in the top 20 prices is low, and the impact cost therein goes up rapidly from around 1 basis point `at the touch' to around 9 basis points at the end. This is the combination of high asymmetric information and high volatility. 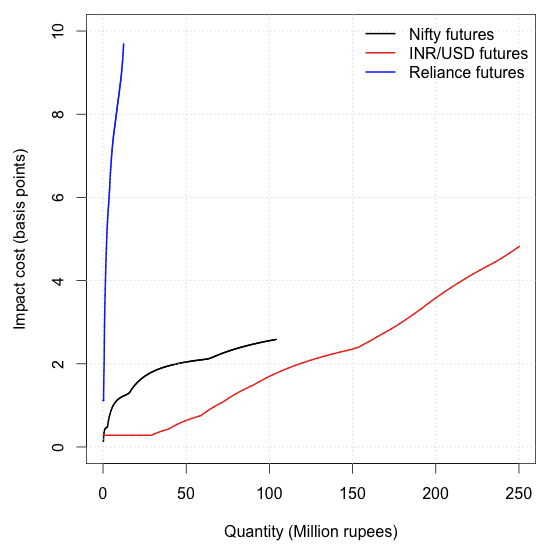 The black line is the impact cost for the April Nifty futures. Within the top 20 prices, roughly Rs.100 million or $2 million was available at this time. A single market order for $1 million would get done at a one-way impact cost of roughly 2 basis points and a single market order for $2 million would get done in a bit less than 3 basis points. The INR/USD futures yields a lot of quantity within the top 20 prices: all the way out to Rs.250 million or roughly $5 million or 5000 contracts. The impact cost for $1 million is below 1 basis point and that at $2 million is below 2 basis points - so this is more liquid than the currency forward. I found it intruiging that at $2 million (i.e. Rs.100 million) the impact cost for Nifty and for the INR/USD were not that different. To look at these orderbooks in realtime, use the links in the previous blog post. The tick size of this market is 0.25 paisa, so the top five prices cover 1.25 paisa on each side. So there's nothing interesting about the prices: I focus on the quantities. I'm used to generally seeing quantities at each prices running all the way to 1000 to 2000 contracts which is $1m to $2m. Today I was surprised to see two quantities with much bigger values: $6m and $11.3m. This is huge. [NSE currency futures page] I was also impressed at the fact that $32.6m and $42.4m of orders are sitting on this order book. These are big numbers. In your mind you have to divide the quantities by 10 to make them comparable. Hence, the spreads and the quantities in the top five are not as impressive as those of the currency. But the total orders present on the book here are staggeringly large when compared with the currency. Theory tells us that liquidity should vary with asymmetric information and volatility. Both Nifty and the currency are macroeconomic underlyings with relatively little asymmetric information. But Nifty is more volatile. So if both markets worked well, we would expect Nifty to be less liquid. Some key differences are obviously visible: foreigners trade on the Nifty futures but are banned from the currency futures, and Nifty options are available while currency options are not yet available (though without foreigners). When these differences go away, the picture will change further. A paper idea: When a central bank shifts to a more transparent framework on currency trading, or when a central bank steps away from currency trading altogether, asymmetric information on the currency market goes down so currency impact cost should go down. I wonder if one can find some natural experiment of this fashion. Matters are complicated because the date on which a float commences if often not the date on which the float is announced. This can be dealt with by identifying the date on which the exchange rate regime actually changed, as opposed to what is claimed by the central bank. In India, inflation measurement is commonly done using year-on-year growth rates. The change in a price index from March 2009 to March 2010 shows the average rate of change over the 12 intervening months. But the most important thing to focus on is the point-on-point change seen in January, February and March. Computing this requires first seasonally adjusting the price index, so as to avoid being confounded by seasonal fluctuations. We do this at http://www.mayin.org/cycle.in with updation every Monday. Another big issue in inflation measurement in India is the problems of food and fuel. In both cases, there's an element of administered prices, so a jump in the point-on-point seasonally adjusted price level might just be a month in which the government raised a price. This is not a statement about the deeper inflation in the economy. In any case, fuel prices are greatly influenced by the global oil price. Food prices often jump around reflecting a good harvest or a bad harvest. In order to understand the deeper `core' inflation in the domestic economy - the stuff that domestic monetary policy should care about - it's useful to look at the WPI excluding food and fuel. Starting with yesterday's release, we do this also. The recent rupee appreciation, followed by rumours of RBI intervention, has set off fears that we're in for a repeat of the sad episode of monetary policy 2006/2007 all over again. Writing in the Business Standard, Shankar Acharya repeats the advice that he gave RBI in 2006 and 2007. But new perspectives are now visible: see a striking piece by Ravi Jagannathan in DNA, and Pratap Bhanu Mehta in the Indian Express. Ila Patnaik, in the Indian Express, emphasises that monetary tightening and exchange rate appreciation go together. T. N. Ninan on the four groups at work on the creeping expansion of welfare programs in India. In addition to Parth Shah's blog post The Right to Education Act: A critique, also see Opening school doors to India's poor in the Wall Street Journal and The wrong way to school in the Mint. Also see Gurcharan Das in the Business Standard and Ashok Desai in Business World. An editorial in the Financial Express on one step towards India as a unified country. And, see M. Govinda Rao on the issues surrounding the `fiscal council' proposal of the 13th Finance Commission. The living debt by Ila Patnaik in the Indian Express. Benchmark Mutual Fund has written two interesting documents: The myth of eternal alpha and The myth of predictable alpha which have new insights on the performance of fund managers in India. A fascinating discussion on these sprang up as comments on this blog post. The Indian Corporate Law blog points us to the very important prospectus of the Standard Chartered IDR on the SEBI website. What India does right: the private equity industry doesn't particularly have people with parents in politics or government, when compared with what is going on in China. Another thing that India does not have: outsized foreign exchange reserves. P. J. O'Rourke once said: Giving money and power to government is like giving whiskey and car keys to boys. Most policy economists are careful in this respect, in terms of asking for a small expenditure/GDP ratio, in asking for government to live within its means, and in asking for every government agency to be enveloped in strong accountability mechanisms. In this entire framework, the large pools of assets in the form of foreign exchange reserves have got a free pass. Writing in the Wall Street Journal, Cathy Holcombe brings some original ideas into the debate on how much foreign exchange reserves a country should hold. India has been doing well in this regard: reserves have dropped from a peak of $305 billion to a most-recent value of $255 billion, which is 20% of GDP. This is most likely too much, but it isn't a problem on the scale of China's reserves. On a related theme, see this blog post on an Indian sovereign wealth fund. Tarun Ramadorai in the Financial Express on the Reinhart/Rogoff findings about sovereign default, and how to interpret their story. Nomination for the worst website in GOI: http://www.dgciskol.nic.in. It seems to violate every single guideline that I can think of. Exploring Bohemian Mumbai by Kavitha Rao in a travel blog on the New York Times website. Technology Review magazine profiles the 20 most brilliant innovators in India below age 35. There is a sea change in store in India when the next generation takes over. Turning to scientists of all ages, the ISI Web of Knowledge shows 9 people from India in their list of highly cited scholars. For a comparison, China (including Hong Kong) has 24 such scholars, and little Israel has 49. Cory Doctorow is not optimistic about the Apple iPad. The Economist says it's time to go back to copyright being limited to 28 years. Robots coming into the mainstream: a story by Tim Hornyak on Cnet. On Marginal Revolution, the policy wonk's lament. The children of the twentieth century know that political and military catastrophes are entirely possible. Ben Judah has a great first draft of history in Foreign Policy magazine, telling his story from two days in Kyrgyzstan. The children of the twentieth century locate a recent plane crash in western Russia in its larger story. Lech Walesa is quoted in this story in the Wall Street Journal by Marc Champion and Marcin Sobczyk as saying: This is a tragedy that's second after Katyn. Liz Robbins on the New York Times blog tells the tragic historical setting which frames this crash. The movie, Katyn, by Andrzej Mularczyk, is searing and unforgettable. See some photographs at The Big Picture on boston.com, and read Timothy Garton Ash in the Guardian. On 9 April (Friday), SEBI came out with an order against insurance companies selling mutual-fund-like products without being regulated as mutual funds are [pdf]. IRDA has come out with a press release and an order. My immediate response in a blog post was that this underlines the problems of a silo system. In Financial Express today, I have a column on the subject: SEBI rules and insurance companies. See Jayant Thakur on the Indian Corporate Law blog. Reportage in the Mint by Kayezad E. Adajania, N. Sundaresha Subramanian and Deepti Bhaskaran. Reportage by K. V. Ramana in DNA. Vivek Kaul in DNA looks at the extent to which ULIPs have an insurance component. An interview with J. Hari Narayan, chairman of IRDA, in the Business Standard. Gautam Chikermane has an excellent piece in the Hindustan Times. Timely investment advice for us from Carl Richards on the New York Times blogs. How important is financial reform? One sees a lot of crude real vs. financial reforms arguments in India these days. Many people are convinced that a sophisticated financial system is not important for India's growth. Two papers which came out in the last week help illuminate these questions. In a working paper Quantifying the Impact of Financial Development on Economic Development, Jeremy Greenwood, Juan M. Sanchez and Cheng Wang look at the size of the impact of financial modernisation in economic development. The headline summary: Roughly one-third of Uganda's underdevelopment would go away if it built a world class financial system (and did nothing else right). In a paper Can financial development cure the dutch disease? in International Journal of Finance & Economics, Christian Saborowski tells a story that's directly pertinent in today's India: when the domestic financial system is more liquid, the exchange rate appreciation associated with capital inflows is reduced. India has long operated a `silo system' where the financial industry was sought to be broken up into vertical silos associated with regulatory agencies. The word `regulation' is relatively little understood in India. Instead, there has been a central planning notion of comprehensive `control' of a given financial firm vesting in a given regulator, so that a somewhat feudal arrangement prevails in each silo. This is not how an efficient financial system works. As Percy Mistry's report says, in the future, government needs to to reorganise itself to fit the regulatory requirements of a sophisticated financial system, instead of trying to force financial firms to reorganise themselves to fit the almost accidental regulatory architecture that prevails in India today. In recent years, many changes in finance have hinged on breaking the strictures of this silo system. Two success stories that come to mind include ETFs on gold and currency futures. We need the Financial Stability and Development Council (FSDC) yesterday. Shekhar Gupta's column in the Indian Express today is about the incipient threats faced by freedom of speech in India. In this ranking for 2009, by Reporters without Borders, India's freedom of press comes in at rank 106 out of 175 countries (top 60th percentile). We're in the company of Burundi, Côte d’Ivoire, Guatemala and Oman. Ouch! (In 2002, we were slightly worse: we were in the top 56th percentile). If you'd like to think about how this can be made better, an ideal starting point is their questionnaire. There is a great piece by Donald Morrison on the Dreyfus Affair in the Financial Times. I often wonder whether India has the depth of commitment to human rights and liberal values to be able to achieve a similar outcome. At present, I'm not convinced. As Norman Mailer said: Democracy is a state of grace that is attained only by those countries who have a host of individuals not only ready to enjoy freedom but to undergo the heavy labor of maintaining it. At present, in India, I don't see that bunch of people who care about freedom and will safeguard it. Users are required to register with an ISP when they purchase internet access at home or at work, so that they cannot operate online anonymously. Customers at cybercafes have to present identification, and cybercafes install software to monitor and filter customers' web browsing. In Vietnam, cybercafe owners are required to keep a record for 30 days of all the websites their customers visit. Do we do similar things in India? I've seen the following pattern repeatedly: In measures of governance quality, India looks good when compared with China and Russia. So two of the BRIC countries really have a system of governance which is not comparable with that found in India. Far more interesting are the BSST countries -- Brazil, South Africa, South Korea and Taiwan -- which are democracies much like India, and have a lot of things done right in governance which India should learn from. As is evident, even after 60 years, universal elementary education remains a distant dream. Despite high enrolment rates of approximately 95% as per the Annual Status of Education Report (ASER 2009), 52.8% of children studying in 5th grade lack the reading skills expected at 2nd grade. Free and compulsory elementary education was made a fundamental right under Article 21 of the Constitution in December 2002, by the 86th Amendment. In translating this into action, the `Right of Children to Free and Compulsory Education Bill' was drafted in 2005. This was revised and became an Act in August 2009, but was not notified for roughly 7 months. The reasons for delay in notification can be mostly attributed to unresolved financial negotiations between the National University of Education Planning and Administration, NUEPA, which has been responsible for estimating RTE funds and the Planning Commission and Ministry of Human Resource and Development (MHRD). From an estimate of an additional Rs.3.2 trillion to Rs.4.4 trillion for the implementation of RTE Draft Bill 2005 over 6 years (Central Advisory Board of Education, CABE) the figure finally set by NUEPA now stands at a much reduced Rs.1.7 trillion over the coming 5 years. For a frame of reference, Rs.1 trillion is 1.8% of one year's GDP. Private schools must take in a quarter of their class strength from `weaker sections and disadvantaged groups', sponsored by the government. The Act unfairly penalises private unrecognised schools for their payment of market wages for teachers rather than elevated civil service wages. It also penalises private schools for lacking the infrastructural facilities defined under a Schedule under the Act. These schools, which are extremely cost efficient, operate mostly in rural areas or urban slums, and provide essential educational services to the poor. Independent studies by Geeta Kingdon, James Tooley and ASER 2009 suggest that these schools provide similar if not better teaching services when compared to government schools, while spending a much smaller amount. However, the Act requires government action to shut down these schools over the coming three years. A better alternative would have been to find mechanisms through which public resources could have been infused into these schools. The exemption from these same recognition requirements for government schools is the case of double standards -- with the public sector being exempted from the same `requirements'. By the Act, SMCs are to comprise of mostly parents, and are to be responsible for planning and managing the operations of government and aided schools. SMCs will help increase the accountability of government schools, but SMCs for government schools need to be given greater powers over evaluation of teacher competencies and students learning assessment. Members of SMCs are required to volunteer their time and effort. This is an onerous burden for hte poor. Payment of some compensation to members of SMCs could help increase the time and focus upon these. Turning to private but `aided' schools, the new role of SMCs for private `aided' schools will lead to a breakdown of the existing management structures. How will `weaker and disadvantaged sections' be defined and verified? Moreover, the method for calculation of per-child reimbursement expenditure (which is to exclude capital cost estimates) will yield an inadequate resource flow to private schools. It will be tantamount to a tax on private schools. Private schools will endup charging more to the 75% of students - who are paying tuitions - to make space for the 25% of students they are forced to take. This will drive up tuition fees for private schools (while government schools continue to be taxpayer funded and essentially free). By dictating the terms of payment, the government has reserved the right to fix its own price, which makes private unaided schools resent this imposition of a flat price. A graded system for reimbursement would work better, where schools are grouped -- based on infrastructure, academic outcomes and other quality indicators -- into different categories, which would then determine their reimbursement. Despite the flaws in the RTE Act, it is equally important for us to simultaneously ensure its proper implementation. Besides bringing about design changes, we as responsible civil society members need to make the government accountable through social audits, filing right to information applications and demanding our children's right to quality elementary education. Moreover, it is likely that once the Act is notified, a number of different groups affected by this Act will challenge it in court. It is, therefore, critically important for us to follow such cases and where feasible provide support which addresses their concerns without jeopardizing the implementation of the Act. Finally, along with ensuring implementation of the RTE Act which stipulates focused reforms in government schools and regulation for private schools, we need to broaden our vision so as to create an ecosystem conducive to spontaneous private involvement. The current licensing and regulatory restrictions in the education sector discourage well-intentioned `edupreneurs' from opening more schools. Starting a school in Delhi, for instance, is a mind-numbing, expensive and time-consuming task which requires clearances from four different departments totaling more than 30 licenses. The need for deregulation is obvious.